The woman walked into my office at the Jewish Federation, a little breathless. I had no idea who she was; but she seemed excited to tell me something. I was used to this. As editor of the local Jewish newspaper, people frequently came into my office to give me story tips, to share their thoughts, or to complain. The woman didn’t’t seem like she was going to do any of those things. But she was bursting to tell me something. Ok, very nice, but I’m from Dallas. Why was she telling me this? I must have looked confused. I did a quick flip-through in my head of articles I had written. And then it dawned on me. In a piece about the great Galveston Hurricane of 1900, I’d written that my great-grandfather, a rabbi and shochet, had been sent to Texas to lead the Galitzianer community by the Czortkower rebbe. My great grandfather was actually from another town, but he had attended the yeshiva there. And that was my introduction to Lola Kaufman, a Holocaust survivor who, as a very little girl, was hidden in a hole in the ground with three other people. I didn’t’t know that then. We chatted briefly and she left; but she seemed happy, satisfied to have made some connection to the town of her childhood, no matter how tenuous it was. I’m thinking about Lola, because after Kol Nidre services, I learned that she had died that week. The next day I added her name to the yizkor prayer. I didn’t get to know her well, but like many people in our community, I got to know her better when she later told me her story for the newspaper. Lola’s world as she knew it came crashing to a halt when the Nazis invaded the Soviet Union in 1941 and rolled into Czortkov, imposing their vicious cruelty on a town that was home to a Chasidic dynasty. Kaufman’s family wasn’t that sort of religious, but as we know, the Nazis didn’t make distinctions. Her memories are not ones that you would want. She saw a soldier gun down an older man in the town square as she screamed, witnessing it from the front window of her house. Later, her family was herded into a ghetto. Her father died there. Her mother was shot along with two other women who were working outside the ghetto, all of whom had permits. Her grandmother managed to get her to “safety,” and she lived for nine months in a dark, infested hole beneath a vegetable cellar in a barn with three other people, including a girl two years younger than she. I never met my great-grandfather, so I couldn’t share too much with her of my own family’s memories of the place. And even though my family had escaped the Shoah, no one really spoke much about their European past. As if they wanted subsequent generations of us to believe they had arrived fully American on these shores, funny accents notwithstanding. 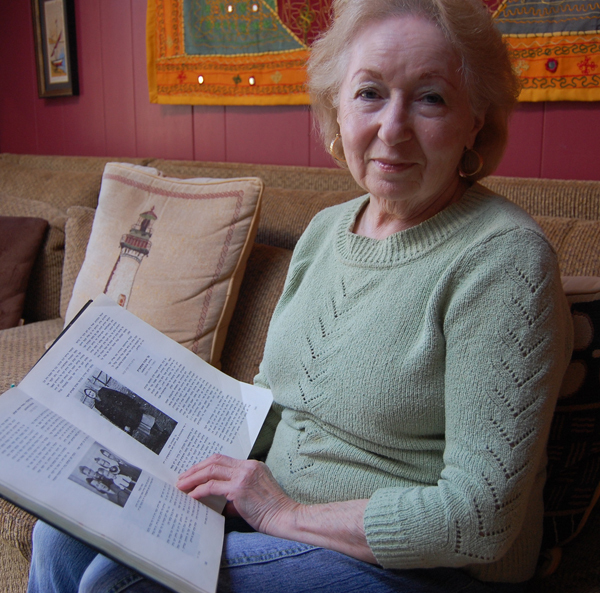 Lola would have understood that — once she moved to New York after the war, she lived surrounded by Holocaust survivors. Yet no one spoke of it. It wasn’t until she read a magazine story in 1990 about a conference for hidden children that she began to talk about her past. Instead, when I visited Lola in her home in New City to interview her, she showed me pictures of the town, and I felt a strange connection to her, and to the place. It was odd to think that my great grandfather, someone with whom I shared DNA, had walked the very streets she was pointing to, and attended the yeshiva that dominated the town. I thought about Lola throughout Yom Kippur day and was sad that I hadn’t known about her funeral. I guess I felt someone “from Czortkov” should have attended, so a little guilt hung around me that I hadn’t. Lola was nearly 80, and “young” for one who survived the war. She certainly did not seem that old to me, and I took for granted that she would be around to talk to once again. Soon, only the hidden children will be left from that generation, and when they are gone, there will be no one who experienced the Shoah first hand. This is the way all things pass from experience into history, but with so much anti-Semitism erupting in Europe today and with Holocaust denial a pernicious threat, losing that first-hand connection and testimony has consequences. Who remains to tell the truth? And if there are those who can deny eye-witness accounts, what will happen when there is no one left who experienced this to tell them? Tomorrow begins Hoshana Raba, and the ending of the fall chag cycle. On Hoshana Raba, we have our last chance to make final supplication and to seal our fate. There is a tradition that says that the Yom Kippur judgment is not delivered until this final day of Sukkot. It strikes me though, that while there is a huge component to the holidays that focuses on predestination, we fight it throughout, with the idea that our prayers, charity and acts of loving-kindness can avert whatever fate might have been planning. We say that on Yom Kippur the gates of prayer close, and those who were written in the Book of Life at Rosh Hashanah will now be sealed. The gates are closing for an entire generation, people who could not always speak about what they had witnessed. My children’s generation is the last to have personally known Holocaust survivors and to have heard from them first hand. It will be up to them eventually to tell those stories. It is a fate not to be sealed and forgotten, but inscribed in our ongoing book of life. May Lola’s memory be for a blessing. Thank you for writing such a beautiful article about my Mother. It was a pleasure and and honor to have met her. I was so sorry to hear she had died. She was such a lovely person. Hello! I from Czortkow and i was read book of Lola Rein Kaufman, In Czortkow meeting was in the city library I could read a book to the Ukrainian. Mr. Kaufman… several years ago, you were so gracious and kind to connect me with your mother. I had fallen very ill and derived so much strength from your mother’s story. I just wanted to thank her for the courage to speak up and speak out and you gave me that opportunity. While I am not in remission, I had finally built up my strength enough to travel. I have a niece who lives in NYC and had hoped to combine a visit to her with a visit to your mother. Also…My niece is the Chief Meterologist at Good Morning America and I had hoped to be given permission by GMA to invite your mother to appear on the show so she could be honored for her courage and for sharing her story. I sat down to write your mother to ask her if she would appear on GMA (if I could arrange it) and if I could bring her a gift I had made for her…. only to learn of her passing: my heart sank. I wept. I am heartbroken that I will never be able to personally thank her for her strength, inspiration and kindness. She will live on in my heart and the hearts of many. May she rest peacefully. Thank you again, Mr. Kaufman, for giving me the chance to correspond with your mother. I will treasure my letter from her for the rest of my days.